Jordanian member criticizes Israel for something he himself did. The UN Watch organization has called out the UN High Commissioner for Human Rights for his "double standards" in coming out against Israel. 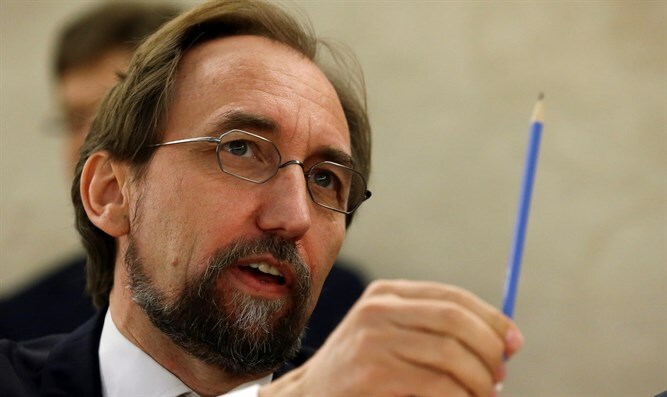 Earlier this week, UN rights chief Zeid Ra’ad al-Hussein of Jordan accused Israel of acting like Iran, Syria and North Korea by having “a long record of refusing to cooperate" with UN Human Rights Council inquiries and investigative mandates. He was referring, apparently, to incidents that Israel believed were being handled with unfair bias against it. UN Watch, a non-governmental organization (NGO), took the floor at the Council on Wednesday and reminded al-Hussein that he, too, has boycotted UN debates that he believes are biased and illegitimate – and that he has taken blatantly one-sided stances against Israel. "The High Commissioner rightly mentioned abuses by Venezuela, and said his office would speak out at 'every opportunity.' If so, why has his Twitter account, followed by 1.5 million people, refused to post even one word on Venezuela over the past 6 weeks of escalating hunger, arbitrary arrests, and oppression? "The High Commissioner mentioned Crimea, Abkhazia, and Nagorno-Karabakh — yet failed to say that, under international law, these are occupied territories. Instead, he only used that term in one case: for the Palestinian territories. Why?" The UN Watch spokesman then called out al-Husseini for lumping Israel together with Iran, Syria and North Korea in that all of them refused to cooperate with UN inquiries. However, he said, this does not take into account Israel's legitimate complaints. "Mr. President, when this Council’s inquiries prejudge Israeli guilt; disregard terrorist aggression; select biased judges who have done paid legal work for the PLO; and then hire biased staffers who are also spokespersons for the pro-Hamas flotilla — would not the High Commissioner agree, using his own words, that there is a 'distinct agenda', a 'flavor', to all of this? "Indeed, when this council literally has a distinct agenda item for Israel alone… can there be any greater evidence of a 'narrow aim', which should be 'unacceptable' to all?